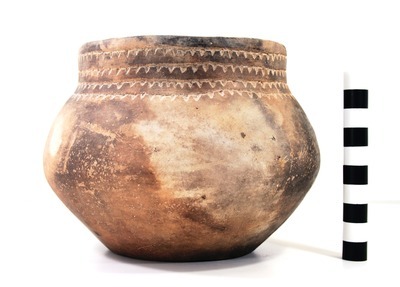 "41HS261, 2003.08.5, Burial 4, Vessel 8" by Timothy K. Perttula and Robert Z. Selden Jr.
DECORATION (INCLUDING MOTIF AND ELEMENTS WHEN APPARENT): The rim has two equally-spaced horizontal engraved lines on the rim, and two more on the upper vessel body. Each horizontal engraved line has a series of excised pendant triangles whose apexes point towards the vessel base. Patton Engraved, var. Allen carinated bowl, Burial 4, Vessel No. 8, J. O. and Henry Brown site.